The point we will be making here is that logically, neither trial and error nor "chance" and serendipity can be behind the gains in technology and empirical science attributed to them. By definition chance cannot lead to long term gains (it would no longer be chance); trial and error cannot be unconditionally effective: errors cause planes to crash, buildings to collapse, and knowledge to regress. The luck versus knowledge story is as follows. Ironically, we have vastly more evidence for results linked to luck than to those coming from the teleological, outside physics—even after discounting for the sensationalism. In some opaque and nonlinear fields, like medicine or engineering, the teleological exceptions are in the minority, such as a small number of designer drugs. This makes us live in the contradiction that we largely got here to where we are thanks to undirected chance, but we build research programs going forward based on direction and narratives. And, what is worse, we are fully conscious of the inconsistency. The beneficial properties have to reside in the type of exposure, that is, the payoff function and not in the "luck" part: there needs to be a significant asymmetry between the gains (as they need to be large) and the errors (small or harmless), and it is from such asymmetry that luck and trial and error can produce results. The general mathematical property of this asymmetry is convexity (which is explained in Figure 1); functions with larger gains than losses are nonlinear-convex and resemble financial options. Critically, convex payoffs benefit from uncertainty and disorder. The nonlinear properties of the payoff function, that is, convexity, allow us to formulate rational and rigorous research policies, and ones that allow the harvesting of randomness. 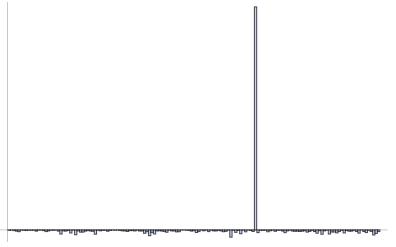 Figure 1- More Gain than Pain from a Random Event. The performance curves outward, hence looks "convex". Anywhere where such asymmetry prevails, we can call it convex, otherwise we are in a concave position. The implication is that you are harmed much less by an error (or a variation) than you can benefit from it, you would welcome uncertainty in the long run. Further, it is in complex systems, ones in which we have little visibility of the chains of cause-consequences, that tinkering, bricolage, or similar variations of trial and error have been shown to vastly outperform the teleological—it is nature's modus operandi. But tinkering needs to be convex; it is imperative. Take the most opaque of all, cooking, which relies entirely on the heuristics of trial and error, as it has not been possible for us to design a dish directly from chemical equations or reverse-engineer a taste from nutritional labels. We take hummus, add an ingredient, say a spice, taste to see if there is an improvement from the complex interaction, and retain if we like the addition or discard the rest. Critically we have the option, not the obligation to keep the result, which allows us to retain the upper bound and be unaffected by adverse outcomes. While getting a better recipe for hummus will not change the world, some results offer abnormally large benefits from discovery; consider penicillin or chemotherapy or potential clean technologies and similar high impact events ("Black Swans"). The discovery of the first antimicrobial drugs came at the heel of hundreds of systematic (convex) trials in the 1920s by such people as Domagk whose research program consisted in trying out dyes without much understanding of the biological process behind the results. And unlike an explicit financial option for which the buyer pays a fee to a seller, hence tend to trade in a way to prevent undue profits, benefits from research are not zero-sum. What allows us to map a research funding and investment methodology is a collection of mathematical properties that we have known heuristically since at least the 1700s and explicitly since around 1900 (with the results of Johan Jensen and Louis Bachelier). These properties identify the inevitability of gains from convexity and the counterintuitive benefit of uncertainty ii iii. Let us call the "convexity bias" the difference between the results of trial and error in which gains and harm are equal (linear), and one in which gains and harm are asymmetric ( to repeat, a convex payoff function). The central and useful properties are that a) The more convex the payoff function, expressed in difference between potential benefits and harm, the larger the bias. b) The more volatile the environment, the larger the bias. This last property is missed as humans have a propensity to hate uncertainty. Antifragile is the name this author gave (for lack of a better one) to the broad class of phenomena endowed with such a convexity bias, as they gain from the "disorder cluster", namely volatility, uncertainty, disturbances, randomness, and stressors. 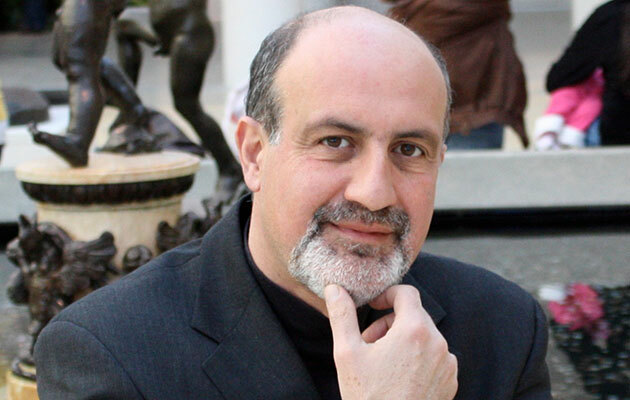 The antifragile is the exact opposite of the fragile which can be defined as hating disorder. A coffee cup is fragile because it wants tranquility and a low volatility environment, the antifragile wants the opposite: high volatility increases its welfare. This latter attribute, gaining from uncertainty, favors optionality over the teleological in an opaque system, as it can be shown that the teleological is hurt under increased uncertainty. The point can be made clear with the following. When you inject uncertainty and errors into airplane ride (the fragile or concave case) the result is worsened, as errors invariably lead to plane delays and increased costs —not counting a potential plane crash. The same with bank portfolios and fragile constructs. But it you inject uncertainty into a convex exposure such as some types of research, the result improves, since uncertainty increases the upside but not the downside. This differential maps the way. The convexity bias, unlike serendipity et al., can be defined, formalized, identified, even on the occasion measured scientifically, and can lead to a formal policy of decision making under uncertainty, and classify strategies based on their ex ante predicted efficiency and projected success, as we will do next with the following 7 rules. Figure 2 The Antifragility Edge (Convexity Bias). A random simulation shows the difference between a) the process with convex trial and error (antifragile) b) a process of pure knowledge devoid of convex tinkering (knowledge based), c) the process of nonconvex trial and error; where errors are equal in harm and gains (pure chance). As we can see there are domains in which rational and convex tinkering dwarfs the effect of pure knowledge iv. Next I outline the rules. In parentheses are fancier words that link the idea to option theory. 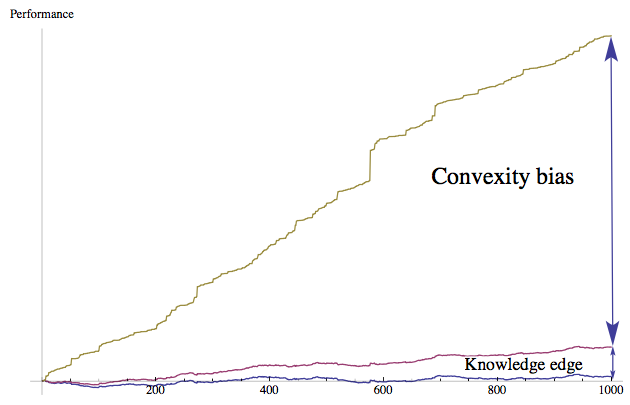 1) Convexity is easier to attain than knowledge (in the technical jargon, the "long-gamma" property): As we saw in Figure 2, under some level of uncertainty, we benefit more from improving the payoff function than from knowledge about what exactly we are looking for. Convexity can be increased by lowering costs per unit of trial (to improve the downside). 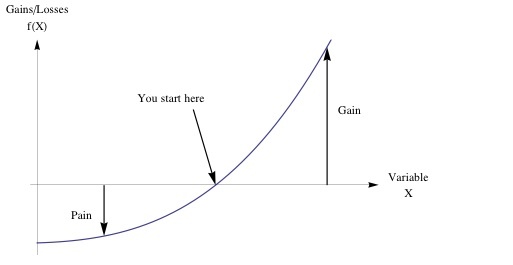 2) A "1/N" strategy is almost always best with convex strategies (the dispersion property): following point (1) and reducing the costs per attempt, compensate by multiplying the number of trials and allocating 1/N of the potential investment across N investments, and make N as large as possible. This allows us to minimize the probability of missing rather than maximize profits should one have a win, as the latter teleological strategy lowers the probability of a win. A large exposure to a single trial has lower expected return than a portfolio of small trials. Further, research payoffs have "fat tails", with results in the "tails" of the distribution dominating the properties; the bulk of the gains come from the rare event, "Black Swan": 1 in 1000 trials can lead to 50% of the total contributions—similar to size of companies (50% of capitalization often comes from 1 in 1000 companies), bestsellers (think Harry Potter), or wealth. And critically we don't know the winner ahead of time. Figure 3-Fat Tails: Small Probability, High Impact Payoffs: The horizontal line can be the payoff over time, or cross-sectional over many simultaneous trials. 3) Serial optionality (the cliquet property). A rigid business plan gets one locked into a preset invariant policy, like a highway without exits —hence devoid of optionality. One needs the ability to change opportunistically and "reset" the option for a new option, by ratcheting up, and getting locked up in a higher state. To translate into practical terms, plans need to 1) stay flexible with frequent ways out, and, counter to intuition 2) be very short term, in order to properly capture the long term. Mathematically, five sequential one-year options are vastly more valuable than a single five-year option. This explains why matters such as strategic planning have never born fruit in empirical reality: planning has a side effect to restrict optionality. It also explains why top-down centralized decisions tend to fail. 4) Nonnarrative Research (the optionality property). Technologists in California "harvesting Black Swans" tend to invest with agents rather than plans and narratives that look good on paper, and agents who know how to use the option by opportunistically switching and ratcheting up —typically people try six or seven technological ventures before getting to destination. Note the failure in "strategic planning" to compete with convexity. 5) Theory is born from (convex) practice more often than the reverse (the nonteleological property). Textbooks tend to show technology flowing from science, when it is more often the opposite case, dubbed the "lecturing birds on how to fly" effect v vi. In such developments as the industrial revolution (and more generally outside linear domains such as physics), there is very little historical evidence for the contribution of fundamental research compared to that of tinkering by hobbyists. vii Figure 2 shows, more technically how in a random process characterized by "skills" and "luck", and some opacity, antifragility —the convexity bias— can be shown to severely outperform "skills". And convexity is missed in histories of technologies, replaced with ex post narratives. 6) Premium for simplicity (the less-is-more property). It took at least five millennia between the invention of the wheel and the innovation of putting wheels under suitcases. It is sometimes the simplest technologies that are ignored. In practice there is no premium for complexification; in academia there is. Looking for rationalizations, narratives and theories invites for complexity. In an opaque operation to figure out ex ante what knowledge is required to navigate is impossible. 7) Better cataloguing of negative results (the via negativa property). Optionality works by negative information, reducing the space of what we do by knowledge of what does not work. For that we need to pay for negative results. Some of the critics of these ideas —over the past two decades— have been countering that this proposal resembles buying "lottery tickets". Lottery tickets are patently overpriced, reflecting the "long shot bias" by which agents, according to economists, overpay for long odds. This comparison, it turns out is fallacious, as the effect of the long shot bias is limited to artificial setups: lotteries are sterilized randomness, constructed and sold by humans, and have a known upper bound. This author calls such a problem the "ludic fallacy". Research has explosive payoffs, with unknown upper bound —a "free option", literally. And we have evidence (from the performance of banks) that in the real world, betting against long shots does not pay, which makes research a form of reverse-bankingviii . i Jacob, F. , 1977, Evolution and tinkering. Science, 196(4295):1161–1166. ii Bachelier, L. ,1900, Theorie de la spéculation, Gauthiers Villard. iii Jensen, J.L.W.V., 1906, “Sur les fonctions convexes et les inégalités entre les valeurs moyennes.” Acta Mathematica 30.
iv Take F[x] = Max[x,0], where x is the outcome of trial and error and F is the payoff. ∫ F(x) p(x) dx ≥ F(∫ x p(x)) , by Jensen's inequality. The difference between the two sides is the convexity bias, which increases with uncertainty. vi Mokyr, Joel, 2002, The Gifts of Athena: Historical Origins of the Knowledge Economy. Princeton, N.J.: Princeton University Press. vii Kealey, T., 1996, The Economic Laws of Scientific Research. London: Macmillan. viii Briys, E., Nock,R. ,& Magdalou, B., 2012, Convexity and Conflation Biases as Bregman Divergences: A note on Taleb's Antifragile.